Using YouTube Remote you can easily control the YouTube on your desktop computer or Internet TV using your Android phone. You can Search, Play, Increase or decrease sound. 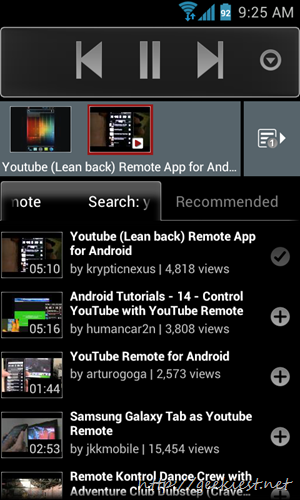 Turn your Android device into a YouTube remote control! Control the YouTube experience from the comfort of your couch! With YouTube Remote, you can use your Android phone or tablet as a remote control for YouTube videos on your desktop computer or Internet TV. Simply visit youtube.com/leanback on your computer or TV, and navigate to My YouTube -> Pair with mobile device. If your friends also have YouTube Remote, they can pair with your TV screen and share control of the playlist. Not sure who that actor is? Want to hear more songs from this artist? Click on the ‘Topic’ button for a world of information about the video you’re watching.